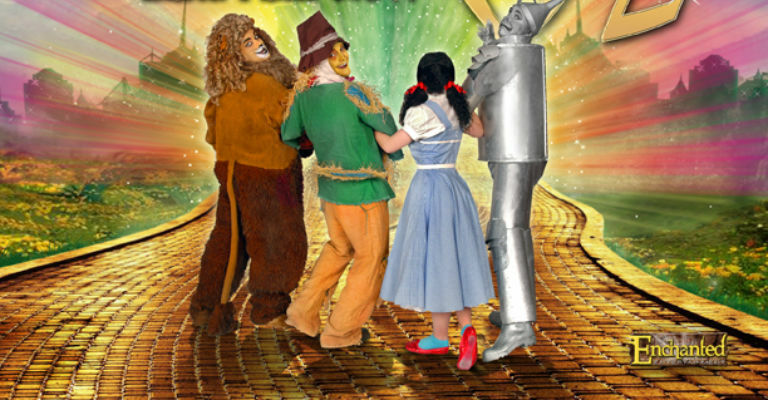 In April, follow the Yellow Brick Road to Tyne Theatre & Opera House for a fantastic all-new Easter pantomime version of The Wizard of Oz, with an all-star cast to be announced! Join Kansas farm-girl Dorothy and her pet dog Toto on this magical adventure suitable for all ages. Watch in amazement as they are picked up by a tornado and carried off to the magical Land of Oz. With help from their new friends the Munchkins, they to travel to the Emerald City where the great Wizard of Oz lives. On their way they meet a Scarecrow who needs a brain, a Tin Man who wants a heart, and a Cowardly Lion who desperately needs courage. Will the wonderful Wizard of Oz be able to help them before the Wicked Witch of the West captures them in her dungeon? Come and join in the fun over the rainbow spring 2017 as Enchanted Entertainment present a wonderful Easter pantomime version of L. Frank Baum’s much-loved fairy tale. Packed with brilliant dance routines, well known pop song, lots of audience participation and plenty of laughter for all the family! There’s no place like Tyne Theatre & Opera House for family entertainment, so click those heels together and book your Easter panto tickets now!